Furry school logos - page 3 - furry lite™ - Furtopia | Family Friendly Furry Forum and IRC Chat! Also: Okay, it would be WAY cooler if the tigers around here were our school colors. Purple and Gold tigers? Pfft-YES. Ask me anything. Tell me anything. Show me anything. Need me? Wanna talk? Message me on here or I'll probably be on the IRC. Awesome avatar by Miser. He's around here somewhere..
'MERICA I'm homeschooled, next year I get to go to high school, thank God I can't take another 4 years of homeschooling! Go Titans! Bulldogs, with red, white, and black colored paw prints ALL over the school. My high school and middle school were the Tigers. I kinda laughed at the mascot suits since I knew they could be SOOOOOO much better and also I had been spoiled by fursuit dancers. While the University of Michigan teams are known as the Wolverines, they actually have no official mascot. Although Ann Arbor residents are reputed to have a rather inflated sense of self-worth. My university's mascot is the SeaWolf. It's a mystical calls that lives in the sea! my high school was the north pike jaguars, and i went to middle school at a private school whose mascot was an eagle. sadly only the jaguars had a suited mascot. My university mascot is a 49er (a miner named Prospector Pete), who is totally human. Ah well. My community college teams were called the Pioneers, but no mascot. A rural high school in the next county call themselves the Rockets, but I haven't been invited. My highschool was a hornet. Nobody wore the mascot suit though in like 20 years. But that was the logo, a hornet. And my college is an owl, which is pretty cool because it looks threatening. My elementary school had a falcon mascot, and my high school had nighthawks! Wild ones would always fly around the football games at night. The local state college sports teams are known as "wildcats". Their mascot is the bobcat, and they have pretty much the most horrifyingly bad mascot costumes I've ever seen. I mean, look at those things! Good lord. Those are the actual, legitimate, beloved mascots of the college. Before someone told me they were bobcats I had no idea what I was even looking at. 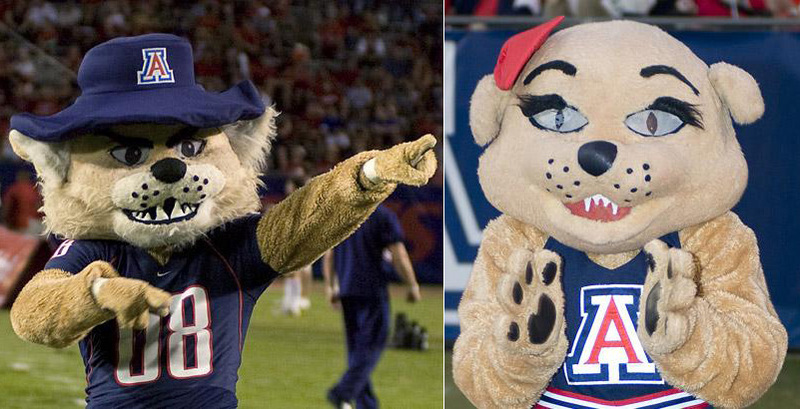 I am so tempted to make my own wildcat fursuit and run around in it just to help those get the retirement they deserve. The one on the left (male) isn't that bad, but the female on the right? Yeesh. My high school was the eagles, although I actually think the mascot mask wasn't half bad...kinda good actually. My college is the Thunderwolves, the logo's pretty cool but I've never personally seen the college mascot. My high school are the tigers and pretty much slather everything with it. Our mascot isn't that bad but I think it could be a little better.